Who says you can't have breakfast for dinner? Traditional breakfast foods are a satisfying way to start the day, but can be a satiable way to end your night. There's so many good options - savory meats, fluffy eggs, hearty maple syrup, and - my personal weakness - pancakes! Unfortunately, pancakes and/or waffles aren't very Paleo friendly. so I did a little research to create a healthy primal alternative. I was inspired by a recipe I found at my favorite fitness blog, Tone It Up!, and made some small tweaks for my diet. 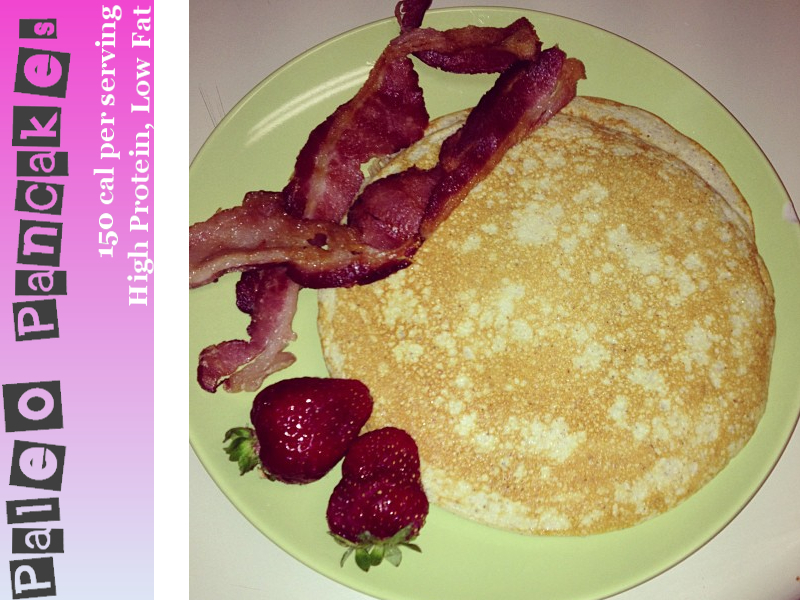 These pancakes are super easy to make and an effortless way to pack more protein into your day. Love these for a post workout treat, or pair them with bacon, eggs, and fruit for an ultimate savory breakfast meal! Cinnamon helps regulate blood sugar levels. Bananas contain potassium to nourish muscles post workouts. Egg Whites are the purest form of protein to get you lean. Almond Butter helps you stay full to keep slim. Mash the banana with almond milk. Once consistency is smooth, add in protein powder. ...and then add in cinnamon and salt. If batter is lumpy, pulse for a few seconds in a blender till smooth. Lightly coat frying pan with oil and set burner to medium. Pour THIN layer of batter into pan and turn burner to medium-low. Cook for several minutes until batter gets bubbly, then carefully flip and finish cooking. Top with fruit, maple syrup, or other Paleo friendly options. I like grilled Turkey bacon (grilling reduces fat)!